Often we are approached by outfitters who would like us to do a television program featuring their hunts. The first thing we tell the outfitter is that we require complete honesty. We are not looking to promote anyone who makes claims they can’t back up. Below, in alphabetical order, is a partial listing of outfitters we have hunted and/or fished with over the years and can recommend. Bear hunting is one of our favorite things to do and film. Year after year Jason Packer amazes us with the size of the bears he puts his clients on. On our last trip with Jason, our 12 year old grandson Mason took two beautiful bears and his dad, Spencer arrowed a 7’2" monster while hunting at ground level from his Smart Seat. Jason hunts wilderness bears, of which many have never seen humans before. This can make for some exciting times on stand, and there always seems to be action with the bears competing for the food. Jason and his staff develop many new sites to keep the bears from getting stand shy. The color phase in this area runs about 10 percent and a huge red eight footer was taken a few years back. The accommodations and food are incredible. You will not be disappointed. Click here to view a hunt with Big Bear Country Outfitters. We find Corey and Jessica Dailey to be devoted to your success. Corey is one of the hardest working outfitters/guides you will ever come across. 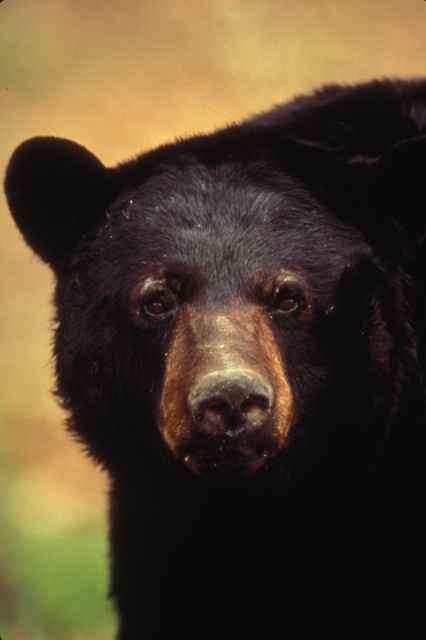 Their area has a very high percentage of color phase bears, and most years it runs fifty percent or higher. Best known as a hounds-man for bears and mountain lions; Corey's archery elk hunts are very productive. Rifle elk hunting is on a draw in his area but if you are lucky in the drawing your chances are excellent at tagging a nice six point. The area also holds some big old mountain mule deer. Antelope and mountain goat are also on Corey’s list of animals hunted. Whatever species you choose Corey and Jessica will give it their all to make your dream hunt a reality. Click here to view a hunt with Corey and Jessica. 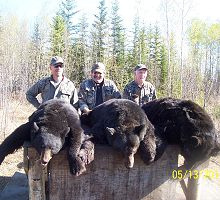 In the spring of 2009 we had the opportunity to bear hunt with Troy White of Mid Maine Outfitters and came away, as his brochure says, feeling like we had made new friends. We didn’t kill a bear with Troy but that was not his fault. One big bruin had a rub mark and the other never gave us that anticipated broadside shot. Both of those bears were the size we were looking for. Troy is a dedicated, hard working guide and has been outfitting for over 20 years. His client retention rate is at 95%, so you can tell he must be doing things right. The hunts, up until 2009, had been strictly in the fall. However, Troy made an agreement with the Penobscot Nation to hunt their territories in the spring and from all reports it has been very successful. 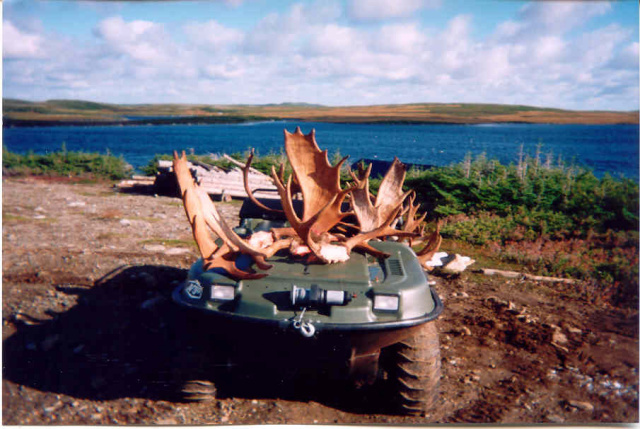 Newfoundland provides excellent big game hunting opportunities. 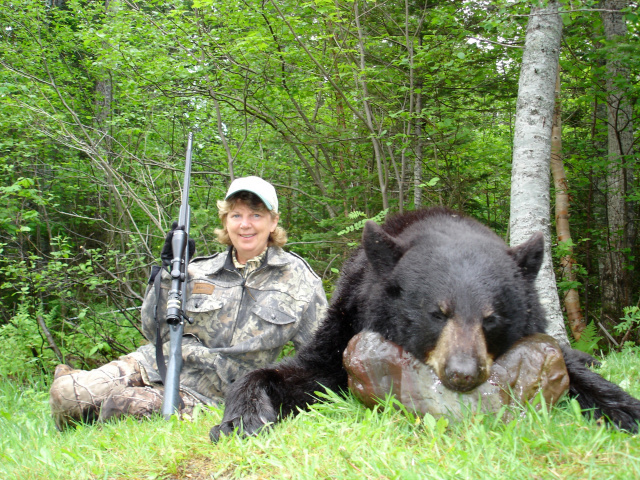 Hazen and Diane Chippet offer great moose hunting, with a very high success rate. However, we experienced what a dream vacation their bear hunts can be. There are plenty of bears, but what we discovered is something very special and unique to their operation. Hazen is a crab and lobster fisherman in addition to his outfitting duties. When joining Hazen and Diane, you will have the opportunity to experience Newfoundland at its finest while at Ocean Side Country Lodge on a spring bear hunt. The Chippets will take you for a cruise in their boat in search of icebergs, bald eagles, whales, and other sea life. Be sure to bring your spouse because you'll be treated to fresh crab and lobster plucked out of the North Atlantic and then cooked over an open fire on a quiet island cove. If you are looking for a hunt with honest hard working people then book with Hazen and Diane Chippet. Click here to view a hunt with Hazen and Diane. If you like to laugh and have a good time while you are hunting or fishing then we can highly recommend joining Steve and Debbie Overguard on your trip of a lifetime. We’ve known Steve and Debbie for over 20 years, and in 2009 we traveled to their Tapawingo Lodge on Bistcho Lake in northwestern Alberta for a moose hunt. Our good friend, Dudley Woodbridge, joined us and you can see the results in the picture. Tapawingo means “Place of Joy” in the native language, and it doesn’t matter whether you are pulling a 20 pound northern pike out of the pristine waters or letting the hammer down on a huge bull moose; you will find joy, coupled with excitement. Both Ruth and Dudley took excellent Canadian moose on this trip. The Overguards are honest, hard working outfitters who will do everything in their power to see to it that you have a good experience. Call them at 403-638-2735 for information on all their hunts and fishing adventures. Click here to view a hunt with Overall Outfitting. Six of us hunted woodland caribou with Trevor and his family in October of 2005 and had a wonderful hunt. We all took nice animals and one member of our group purchased a bird license and bagged his daily limit of ptarmigan. Newfoundland is the only place, to our knowledge, that you can hunt the woodland caribou and Trevor’s area is excellent. He runs a first class operation with the able assistance of his family and top rated guides. Theresa was our cook and Adam, their son, was one of the guides. The trip into camp is by helicopter which makes for smooth landings on the tundra type country. Look no further for a great outfit to hunt woodland caribou. Trevor also hunts moose and books up early for these high success hunts. We recommend the Keough family and Rock Camp Outfitters for a Newfoundland trip of a lifetime. Click here to view a hunt with Rock Camp Outfitters. In the summer of 2014 we had the pleasure of fishing with Sure Strike Charters again! 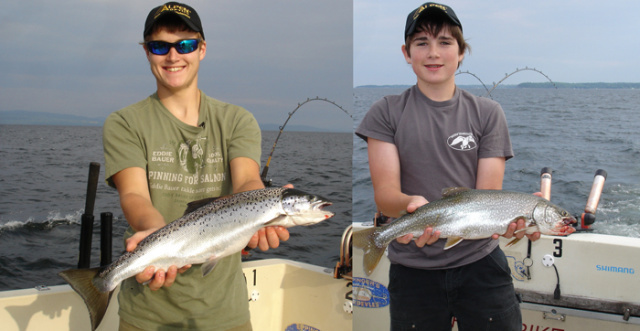 Our grandsons Mason McCuin and Cole Campbell had unbelievable fishing, catching both lake trout and salmon. It was steady action almost the entire time and the boys were in fishing heaven. Sure Strike Charters is the only full-time fishing charter on Lake Champlain and they know where the fish are and how to catch them. Click here to view a show with Sure Strike Charters.